Christmas is just around the corner! Chaplain Chim has already collected many Christmas shoe boxes for the seafarers from faithful supporters' like Mrs. Nita Blocker from the Lutheran Church of the Master in La Mirada. She and her church ladies put together nearly 200 boxes this year. Most of these ladies are doing this work year by year and they are amazing to behold! Many of them are in their 80s! Thank you, Ladies, for demostrating faithfulness in this task for the Lord. The seafarers' so look forward to receiving your gifts. And for all that make the watch caps...a special thank you to you especially on those cold, wind nights when our mariners are at sea. Fall is offi cially here and where did the summer go? Following a successful Open House at the International Seafarers' Center, Chaplain Chim has been busy with mariners nearly everyday he's been in Long Beach. He has a rather regular set of ships he visits but he's open to others as the need arises. His availability to seafarers' has spread by word of mouth and more and more ships crews are emailing to let us know in advance when they are arriving and to invite Chim on board along with other visitors. Ron Nelson, President of the LMM, has been able to accompany him and serve on vessels over the summer too. Imagine climbing those gangway stairs several times a day! On July 25th, Chim and his wife, Fay, once again spoke at both services in the lovely renewed and refreshed Lutheran Church of Our Savior in San Bernardino. It was a pleasure to see our friends at this faithful church again. This year they surprised LMM with a wonderfully generous donation. As is their tradition they also gave more than 70 wrapped gift boxes to be used later during the Christmas season. On August 29th, Chim and Fay had the opportunity to speak after service at Christ Lutheran on Sterns in Long Beach and present a PowerPoint presentation of the work of LMM and responsibilities that Chaplain Chim has taken on. Members of the congregation gave supplies for making shoe box gifts including handmade "watch caps" which are always deeply appreciated by the seafarers in the winter months. A sweet surprise was a brief visit to Southern California by former Chaplian Virginia Sharma. We had a great time visiting and remembering old times together. She came to renew friendships and attend the fundraiser on the Queen Mary for the International Seafarers' Center held on September 16th. We had 2 tables available for our guests at this event and if you are interested in attending next year, please let us know. We had supporters from Gloria Dia, Christ Lutheran, Downey Lutheran Church and First Lutheran in Torrance this year. Other guests at our tables included Father Henry from the Catholic Church and a couple, Brian and Maura, from Fountain of Life Church in Long Beach. While on board the Queen Mary we enjoyed a fireboat water display, a race between the Habor patrol and the Police department and a tug boat race. We continue to seek people interested in volunteering for service at LMM either on the Board of Directors or in any other capacity that the Lord lays on your heart. Nancy Kahakauwila from Gloria Dia has shown an interest in LMM and has attended a borad meeting with pleasure. There have been many deep and meaningful conversations between Chim and some of the seafarers. Please see photos attached and remember us in prayers as we continue to seek to serve Him. 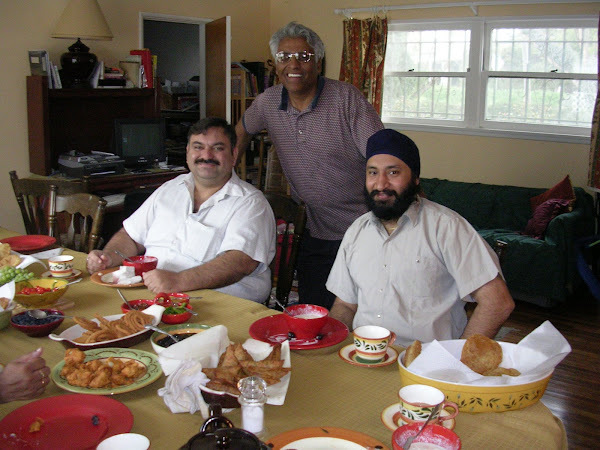 In June 2009, Chim and Fay were able to visit with Sister Virginia Sharma in her Texas home after attending the NAMMAC conference in Houston. This year the conference is in Vancouver, Washington on August 9-12, 2010. It is undecided whether Chim will go this year. The conference theme is 2010 - The Year of the Seafarer. In the meantime, Fay has spent a beautiful week with Virginia attending a Tres Dias weekend and enjoying Virginia's family. Chim has once again had to attend to family business issues in New Mexico but Fay has tried to meet the seafarers' needs as they became known. In April Fay had the pleasure of visiting the MOL Proficiency and our long time friend, Captain Nishant. He visited our home and Fay and our son, Denish, had a lovely time with him sharing the Gospel when appropriate in the conversation. We continue to answer e-mails and phone calls even though we are not at the port at this time. In fact, the APL Tennessee is coming in on Wednesday just as Fay arrives and will be there for them. On the May 15th the APL Colorado comes into port with Captain Ramesh Rai and his family and Chim plans to be there for them. Because the children are on school holiday they will be able to see Disneyland, Universal Studios and other "touristy" things. I am sure the Captain and some of the crew will visit our home for dinner during they stay as well!